Background: Parkinson's disease (PD) is a chronic and progressive disorder of movements of body parts which affect muscles of face, mouth, and throat. This can lead to affect the speech production in various aspects such as changes in voice, difficulty in forming sounds, and slow speech rate. Diadochokinetic (DDK) rate is the most common measures to see the speech production in persons with PD. Methods: This study was carried out on seven persons with PD with the control of medications and compared with the age- and gender-matched control group. Speech sample of DDK (alternating motion rate and sequential motion rate) was recorded in quiet environment. All the participants were instructed to produce syllable with rapid rate in a single breath. PRAAT software was used for the analysis of speech rate. Result and Conclusion: DDK rate was lower in PD group compared to control group. This could be due to limited muscle control and movements of lips and tongue. The crude prevalence rate of PD is 14 per 100,000 in North India. Hoehn and Yahr described PD based on severity of the symptoms. The first stage is difficulty in one side of the body with little loss of function. In the second stage, it is in moderate impairment in which difficulties occur in both sides of the body, but balance is normal. The third stage is same as second stage except now balance is imperfect. The stage-4 is the severe form of movement and balance problem but can stand without support. Stage-5 is the advanced and debilitating stage of Parkinson's where persons are unable to walk without support or required assistive devices. In addition, disturbances in speech, finger movement, and writing are seen. Delay in the initiation of speech movements is a common characteristic of Parkinsonism More Details. Tjaden and Watling studied diadochokinetic (DDK) rate in 11 persons with V and compared with control group. Participants were asked to repeat the syllable/p/followed by/t/and/k/, and/ptk/as rapidly and precisely as possible. The results suggest that there were significant difference in alternating motion rate (AMR) and sequential motion rate (SMR) between persons with PD and control group. In addition to earlier study, Midi et al. evaluated DDK rate and acoustical parameters of voice. They compared DDK rate between 20 persons with PD and 20 normal persons. Results revealed that persons with PD have shorter DDK rate. Various studies have been carried out to find the DDK rate in persons with PD. However, there have been limited studies done so far on the Indian population regarding DDK rate in persons with PD with the control of the effect of medications. Hence, a need is felt to study the DDK rate, i.e., AMR and SMR, in Parkinsonian persons with a control on the medications. 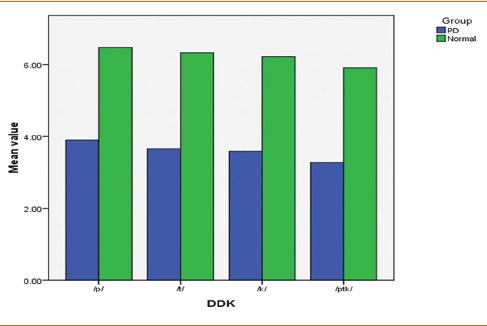 To compare the DDK rate between persons with PD and control group. The present study included 14 participants (10 men and 4 women) who were divided into two groups. Group I considered seven persons with PD (5 men and 2 women) age ranging from 55 to 69 years (mean age of 61.57) [Table 1]. Group II included seven neurologically healthy persons matched for age and gender served as controls. Informed consent was obtained from all the participants. PD was diagnosed by a neurologist after computed tomography scan evaluations. The severity of the PD was leveled according to Hoehn and Yahr stages. Persons with mild or moderate degree of severity and having 3–6 years of onset of problem were considered for the study. Participants were native speakers of Hindi. Mini mental state examination should have >25 points for control group. Speech samples recording were done 1 h before the intake of medicine or 7 h after the medicine. The samples were recorded in a quiet environment without any distractions. The speech samples were recorded using creative (HS-390) head phone (with microphone) which was attached to Lenovo laptop (Core i3, Windows 8.1). The microphone was placed at a distance of 6 cm from the mouth of the participants. The participants were made to be seated comfortably. Participants were advised to follow the instructions and produce syllables as fast as possible on a single breath. Intelligibility of speech was taken care while sample recording. AMR includes production of sound/p/followed by/t/and/k/, and SMR includes/ptk/. Demonstration of each task was done by experimenter. PRAAT software (Paul Boersma and David Weenink, from the Institute of Phonetic Sciences - University of Amsterdam) has been used to analyze speech rate. The values obtained were further subjected to SPSS17 software (SPSS Inc., Chicago, IL). Mann–Whitney U-test was carried out to examine the statistical significance between group in AMR and SMR. The mean value of AMR and SMR was lesser for persons with PD compared to control group [Table 2]. Mann–Whitney U-test revealed a significant difference for AMR, i.e.,/p/(Z = 3.151, P < 0.001),/t/(Z = 3.144, P < 0.001), and/k/(Z = 3.155, P < 0.001) between groups. There was also a significant group difference in DDK rate for the SMR task/ptk/(Z = 3.148, P < 0.001). The current study reveals that DDK rate distinguishes among persons with PD and healthy controls. The AMR and SMR were slower for persons with PD than the healthy controls. This could be due to bradykinesia and rigidity of muscles. Rigidity and bradykinesia might affect the muscles and movements of lips and tongue, leading to a lower DDK rate. These findings are in agreement with earlier studies reporting slower DDK rates for persons with PD., In addition, PD affects muscles of the face and mouth that are used in speaking. It also affects movement in other parts of the body which like a masked face. It can make difficult to communicate the emotions along with what you are saying. Other persons may misinterpret that he or she is not interested in the conversation. Moreover, some people with PD may struggle to find words, and so they may speak slowly. However, Skodda in 2011 reported that Parkinsonian speakers repeat single syllables without accelerating or slowing down the pace. It can be another reason for lower DDK rate for persons with PD which could be due to influence of task-related factors. Ziegler did a study focusing on the potential influence of task-related factors on oral motor performance in persons with PD. He took 140 persons with hypokinetic dysarthria and compared oral DDK. The result revealed that DDK was more affected than sentence production. The results of the present study are significant in understanding the deviant DDK rate, i.e., AMR and SMR, in persons with PD. To conclude, the study adds to literature by supporting earlier studies conducted to delineate the DDK rate of persons with PD. Future studies are required on more number of data in each severity of PD. Lang AE, Lozano AM. Parkinson's disease. First of two parts. N Engl J Med 1998;339:1044-53. Goberman AM, Coelho C. Acoustic analysis of Parkinsonian speech I: Speech characteristics and L-dopa therapy. NeuroRehabilitation 2002;17:237-46. Darley FL, Aronson AE, Brown JR. Clusters of deviant speech dimensions in the dysarthrias. J Speech Hear Res 1969;12:462-96. Hammen VL, Yorkston KM, Minifie FD. Effects of temporal alterations on speech intelligibility in Parkinsonian dysarthria. J Speech Hear Res 1994;37:244-53. Weismer G, Jeng JY, Laures JS, Kent RD, Kent JF. Acoustic and intelligibility characteristics of sentence production in neurogenic speech disorders. Folia Phoniatr Logop 2001;53:1-8. Razdan S, Kaul RL, Motta A, Kaul S, Bhatt RK. Prevalence and pattern of major neurological disorders in rural Kashmir (India) in 1986. Neuroepidemiology 1994;13:113-9. Tjaden K, Watling E. Characteristics of diadochokinesis in multiple sclerosis and Parkinson's disease. Folia Phoniatr Logop 2003;55:241-59. Midi I, Dogan M, Koseoglu M, Can G, Sehitoglu MA, Gunal DI, et al. Voice abnormalities and their relation with motor dysfunction in Parkinson's disease. Acta Neurol Scand 2008;117:26-34. Skodda S, Schlegel U. Speech rate and rhythm in Parkinson's disease. Mov Disord 2008;23:985-92. Skodda S. Aspects of speech rate and regularity in Parkinson's disease. J Neurol Sci 2011;310:231-6. Ziegler W. Task-related factors in oral motor control: Speech and oral diadochokinesis in dysarthria and apraxia of speech. Brain Lang 2002;80:556-75.